The Physual designing network found at physual.net is a collaborative prototype space developed by Kristensen Consulting (KC) and NTNU. It is a framework for collaboration based on four years of groundbreaking research in dispersed engineering design collaboration. Physual is a term that refers to a combination of physical, virtual and visual. Physual designing supports collaborative effectiveness and efficiency in combination teams through a combination of a physical arena, a virtual workspace and selected computer peripherals. The physual designing network is a portal that enables shared access to all resources necessary to engage in collaboration in any team, any time, from any place. Physual.net acts as a common point of access for a workspace for collaboration and document handling in dispersed teams. It provides input about the status or collaborative mode of team members, events and projects, Hence, physual.net acts as an integrated gateway for all resources related to physual designing. 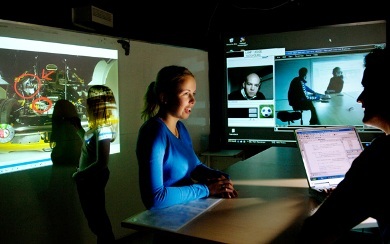 Examples of technologies displayed include large projected displays, interactive whiteboards, wireless keyboard and mouse, and an SMS system for wireless coordination of team activities. Combined, these technologies facilitate creative flow across different working situations. Physual.net uses Internet Time as pioneered by Swatch for easy coordination of real time collaboration.